I enjoy exercising. I have exercised regularly for years. I feel better when I exercise. I’m happier. I’m not as anxious. I am more alert and awake to do the other things I love. I choose to exercise because I see the evidence that it prevents physical atrophy and helps me to be a better “me,” which ultimately helps everyone around me too. 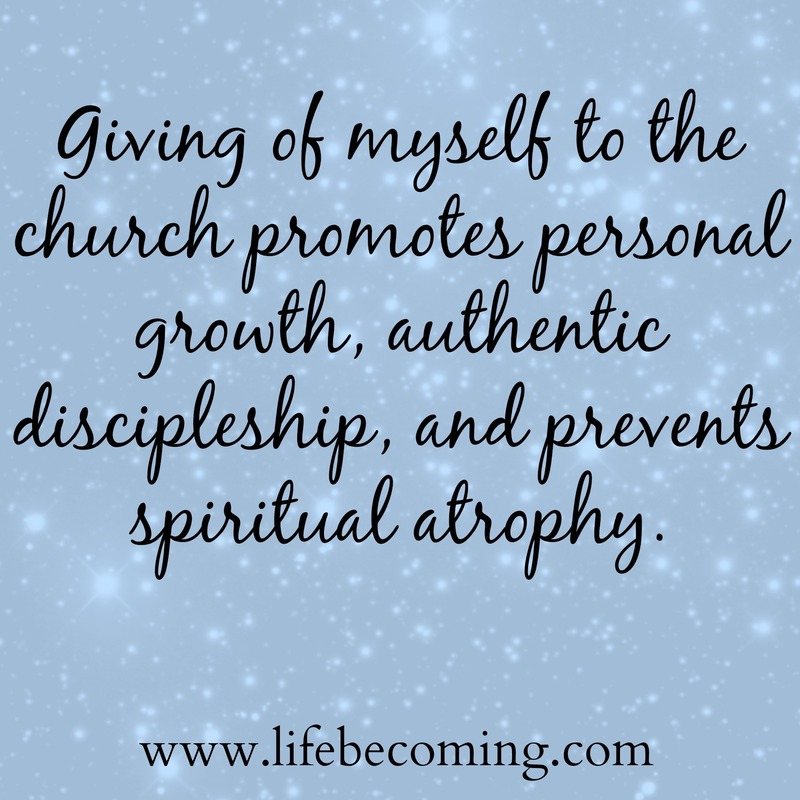 In a similar way, giving of myself to the church promotes personal growth, authentic discipleship, and prevents spiritual atrophy. Giving of ourselves–our time, giftedness, and energy–is actually healthy and good for us, and for everyone around us. I committed my life to following Christ and was baptized when I was 17 years old. For several years after that, I was growing and changing rapidly from the person I was before, but I never chose to step up and serve in the church. I would hear recruit teams share the needs their areas were experiencing, and I would hope to avoid eye contact so that I didn’t have to make up some reason why I couldn’t give of my time to help. If I’m really honest, it wasn’t that I didn’t have time; I just flat-out didn’t want to do it. I didn’t want to make the time to give of myself. I didn’t see how I could add value to my church by serving, and I didn’t see how serving would add value to my life. Fast-forward a few years. I was a college student in Virginia attending Brentwood Church in Virginia (big shout out to my Brentwood Family. I love you guys!). I love that the DNA of Brentwood Church is simple: connect and contribute. Connect through worship on Sundays and in a small group of believers (“Community Group,” “Life Group,” etc. ), and contribute your time, energy, giftedness, and resources to the well-being of the church. If I called Brentwood Church “home,” I was taught consistently and often to be an active participant, and not just an anonymous attender on Sundays. This didn’t come from a perspective of legalism, or expectation, but rather of love and invitation. This church really honed in on the God-given gifts and skills of the people that were there and invited them to use those skills to advance God’s kingdom right there. During my years at Brentwood, I began to feel wanted. I quit believing that I was expendable, and I and started to realize that as a Christ follower, I wasn’t just called to believe, I was invited to be intricately woven into God’s family. Serving wasn’t just for the people that had “arrived,” it was for me too—broken, flawed, imperfect me. I decided to sign up to work with this church’s children’s ministry. I started out just filling in when someone would be absent, and then steadily I became more and more involved. Now, years later, one of my greatest passions is God’s people—all of God’s people—evaluating their God-given skills, talents, and interests and finding a place within the body of Christ to use those gifts. Not everyone gets excited about holding babies every week. Not everyone is comfortable leading. But everyone has something to bring to the table. Whatever “it” is for you—that thing that you LOVE to do just for the sake of doing it—find where you can use THAT in your church. I dare you to test this for a year. Use your skills and passions consistently and often within your home church, and see how you experience deeper satisfaction, deeper feelings of connectedness within your church, and tremendous connection with others serving with you. I think that as people we are wired to weigh opportunity costs. We can’t have or do everything, so we make choices. Sometimes these choices are based on pure motives like what is best for others. Sometimes our choices are based on what has the most value. Sometimes our choices are just for the sake of preference and what we would enjoy the most. I know I am not the only one that struggles against the clock every day. I think that most of us would say we want our time to matter and count towards something; life is too short to waste. Some of you might be like me 10 years ago, and maybe you just don’t see the benefit of giving of your time to your church. Some of you may legitimately be unable to serve during traditional times like Sunday mornings. It’s ok to think outside of the box on your role in your church family! Maybe you attend a house church and there isn’t a major organization to jump right into, or maybe you live abroad and culturally the dynamic of church is very different than “American church”. To all believers reading this, I boldly declare that the Body of Christ transcends culture and time restraints. Serving means giving of yourself to meet the needs of other believers out of your abundance of time and resources. I cannot tell you what this looks like for you personally, but I certainly encourage you to search God’s heart on the matter! He loves you and you were made with purpose! With all of my heart I believe that we each have a vital role. Paul writes to the church in Corinth that we are all equipped with different gifts, and we are called to use them. Can you imagine if your stomach quit working because it said, “This body doesn’t need me; the lungs have got this one.” How crippling! In the same way, we are all a vital part of the global, eternal Body of Christ. You are invited to be all in and more than someone that watchers from the sidelines. Let’s all get in the game and thrive. Like exercise, it may mean carving out the time because you see the value added. But I promise that God uses your energy, time, and talents to change the world when you commit them to Him, when you humbly submit your time and energy to Him to be used up for His glory. Serving impacts your community, your church, your peers, your family, and it impacts YOU! Give it a try. Commit to giving of your time in an area that you are interested in. Give it more than a few weeks—a year?—and see how your own heart changes as a result.